The Event and Conference Management System (ECMS) is a complete solution in the cloud that enables clients with scheduling needs to: schedule meetings, events, and classrooms; create seating diagrams; and interact with attendees. Event Management System (EMS): A scheduling system that enables users with meeting and room scheduling, event scheduling, and classroom scheduling. It also provides a reporting database with real-time utilization statistics to help service providers make informed real estate and facilities decisions. Utilizing a centralized computer-based system, EMS allows calendar administrators to successfully manage their spaces by enabling control of the ordering, communication, and billing with service providers. In addition, EMS allows for the customization of space restrictions and flexibility, also enabling end-users to request space on the go via their mobile application. Social Tables: An event-management platform that lets users to create seating diagrams and plan events and large meetings. 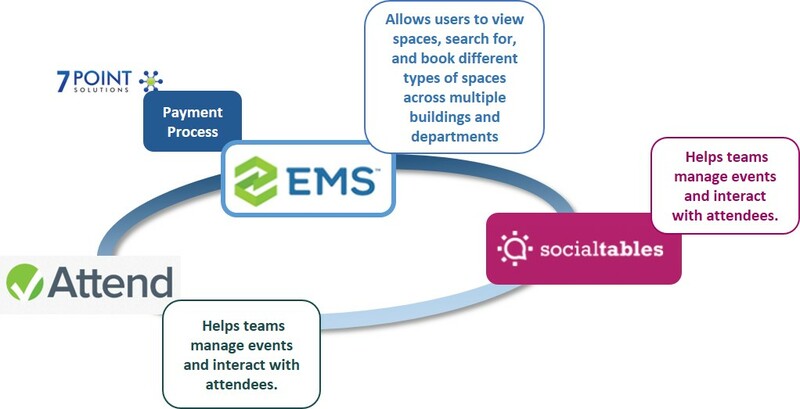 Working with EMS, Social Tables allows you to plan the details of your event seating and add to the EMS event registration. Attend: An event management and engagement platform that helps teams manage events and interact with attendees. Attend allows for customizable event registrations and invitations and has mobile accessibility, in addition to collecting data and providing analytics. Faculty/Staff: Event management personnel and calendar administrators. Students: Students provisioned as applicable. Faculty/Staff: All faculty/staff automatically provisioned. Students: All student automatically provisioned. No costs are associated with this service.